For Hayden Fletcher, who manages a 1200 cow dairy farm near Culverden, it’s important for the whole farm team to be on the same page when it comes to pasture. “It’s key to keep the system really simple and repeatable so everyone in the team, with a range of skills and experience, can operate under that system and make it work day in day out,” says Hayden. Hayden is looking forward to taking part in Tiller Talk and believes it will uncover some opportunities in the business. 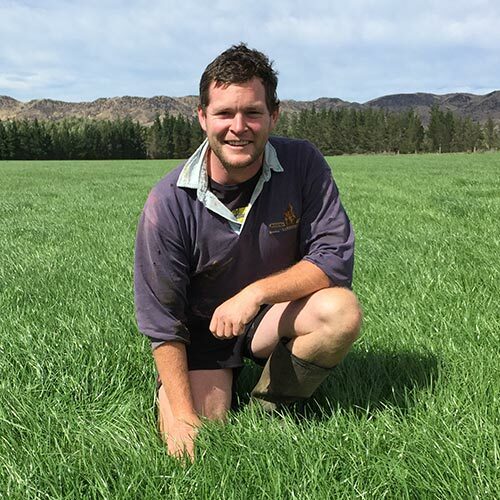 “We also have some trouble with utilising pasture in some blocks of the farm, hence we are after advice around how to maintain more consistent quality throughout the season and ultimately harvest more of that pasture,” says Josh. The farm is a 10 year-old conversion, with half converted in the last four years. The farm is fully irrigated by nine pivots and 80 long line sprinklers. Hayden, who is in his first season on the farm, but 3rd with the group, reports to Josh Dondertman who oversees two other properties in the Craigmore Farming group. They are both in agreeance when it comes to running the property. “It’s all about making more profit – not chasing per cow production, we want to achieve more per hectare, while maintaining similar inputs,” says Hayden. Their goal is to use as little supplementary feed as possible and in early spring, use PKE to substitute the grass and barley to push peak production. They have a regrassing plan where they plan to renew at least 4% of the farm per year.